Plate tectonics is thought to be necessary for maintaining a stable climate capable of supporting life. Some more modeling suggests that both size and surface conditions of the planet are important, with plate tectonics being favored for larger, cooler planets. This implies that plate tectonics on other worlds should correlate with size, incident solar radiation, and atmospheric composition. Planet mass and radius set a constraint for terrestrial planet models and, via models, a planet’s bulk composition can be enterpreted. There is a reference describing the fundamental equations for calculating the interior structure of terrestrial planets (including silicate-rich, iron-rich, and water-rich planets). So even if you are not into modeling, but want to know your conworld better, it’s a good read anyway. In this article, however, I want to focus on geophysical software. And yes, maps. There are numerous software packages (e.g. MELTS, pMELTS, etc. ), created by OFM Research. Some of them are available online in the form of Java applets; all software can be downloaded from the official site. This software provides a computing environment in computational thermodynamics for petrology and geochemistry, which includes complex calculations of the thermodynamic properties of materials, the generation of phase diagrams and pseudo-sections, and the modeling of the chemical evolution of a system along geologically important irreversible reaction paths. pMELTS was used in the research of geodynamics and rate of volcanism on massive earth-like planets by Kite et al. 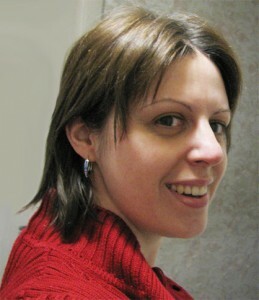 2009, see the previous post. 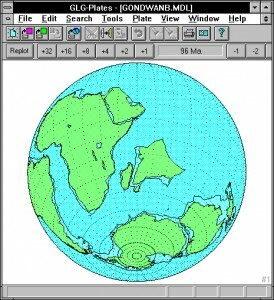 There are some freely available programs for continent reconstruction and plate movement animation, etc. 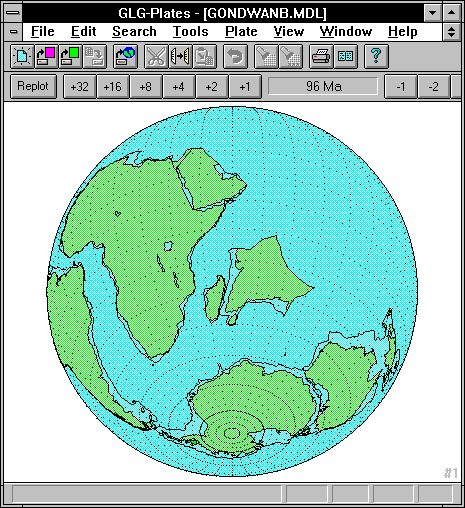 However, keep in mind they they don’t create continents for you, so if you want to model and alien planet, you’ll have to input data from scratch and do some serious work with Cartesian coordinates and what have you. The simplest one is GLG-Plates. This screen grab shows the 96Ma stage of the break-up of Gondwana. GLG-Plates is used by undergraduate students to reconstruct ancient continents. Plate models containing pole data extracted from the published literature are provided. The plate models may be animated. In addition, there are tools for the creation of new plates and additional plate models. GPlates is more sophisticated desktop software for the interactive visualisation of plate tectonics. It offers a combination of interactive plate tectonic reconstructions, geographic information system (GIS) functionality and raster data visualization. GPlates runs on Windows, Linux and MacOS X. A plate tectonic reconstruction is the calculation of positions and orientations of tectonic plates at an instant in the history of the planet. The visualization of reconstructions is a valuable tool for understanding the evolution of the systems and processes of the planet’s surface and near subsurface. GPlates extends the graphical editing capability of GIS (Geographic Information System) software. Operations such as tweaking geometry shapes and manually fine-tuning reconstructed plate positions are interactive graphical operations and can be manipulated directly. 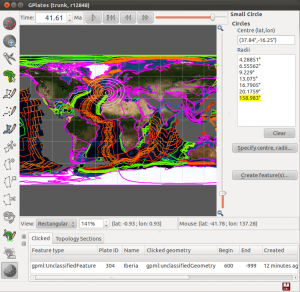 Update: Aug 24, 2013 — Astrographer’s blog has a good tutorial for GPlates. I’m sure many of you heard about PALEOMAP Project. The goal of the PALEOMAP Project is to illustrate the plate tectonic development of the ocean basins and continents, as well as the changing distribution of land and sea during the past 1100 million years in Earth’s history. 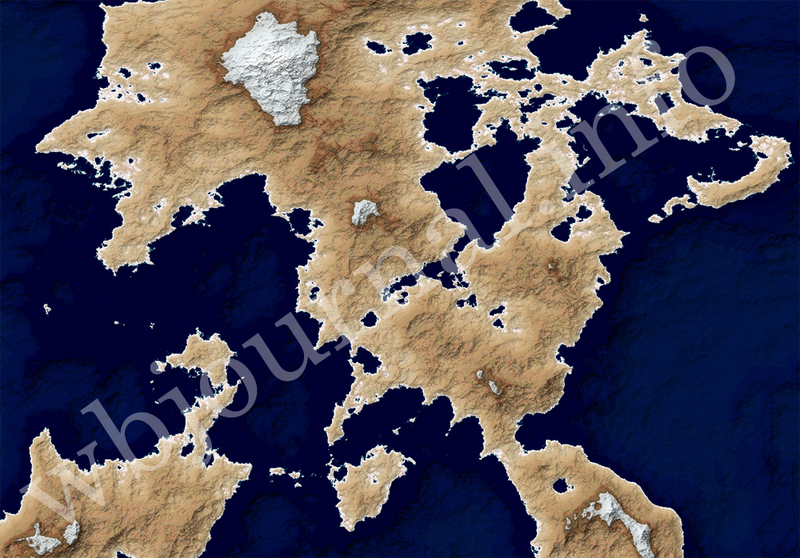 And, of course, future maps. It is a really fascinating idea and I believe it is the best illustration available how a planet behaves. Unfortunately, the software involved in PALEOMAP development is not a free stuff. If all above made you cringe, there is a way to avoid complicated things. It is called Fractal Terrains. It is not a free way, though, but it is not expensive. I got myself an official copy of FT some time ago and I have to admit, it is a very good world generator. If you want to try it out, there is a demo version available. Of course, there is still an alternative to everything, a good old pen & paper alternative. Which one you like is up to you. And if you are fluent in Photoshop and/or AI, more power to you. The World Building School has a very neat tool to create stunning maps. It’s called The Map Generator for Photoshop. It’s not free, but it might be what you’re looking for to create high quality maps for your story and put it in your book. # Have fun! If I find something else to play with, I will add it here. 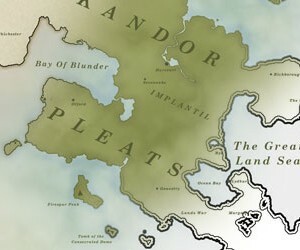 ## If you happen to know some other software that can be used for fictional maps, please share with me.